50 Percent Of Management Is Women, Why So Few CEOs? The number of women in paid employment has risen significantly over the past 40 years. In developed countries especially, there are increasing numbers of women reaching top positions in different fields of work. And new research shows how girls are doing far better than boys educationally across the world. For all this good news for gender equality, however, some of the latest reviews of women and work across the globe reveals that on virtually every measure available, women suffer greater economic exclusion than men. Women’s earnings are significantly less than men’s – on average between 10% and 30% less globally and the jobs available to women across the world remain segregated. In many countries there are obvious limits to what work women are allowed to do – for example places where women require permission from their husbands to work and/ or where they are concentrated in poor quality jobs. Women are concentrated in certain roles and limited to specific management functions in a way that is indicative of the “glass walls” phenomenon, which is occupational segregation by gender. When examining differences in workplace opportunity, management roles are useful indicators of equality. Becoming a manager or senior executive offers the largest chance to achieve economic equality and to influence access for other women in the labor market. To be selected for top management jobs, it is necessary to have diverse experience across different company areas. As long as women are boxed into certain roles, this will not happen – hence the need to break down glass walls before women can break through the glass ceiling to top management. A recent ILO report reveals women hold 50% of middle management positions. 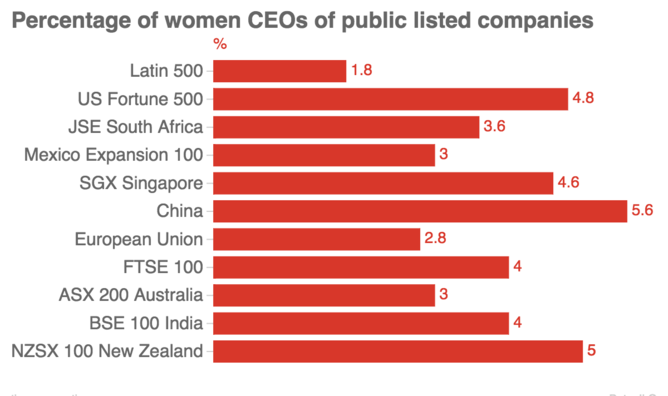 But that is as far as equality extends, as less than 5% of CEOs of publicly listed companies in OECD countries are women and just 2.8% in the European Union. The UK’s Chartered Management Institute reveals a gendered pyramid that is mirrored worldwide, with women holding positions as 60% of junior managers, 40% of middle managers, 20% at senior levels and single digits at CEO. There is also some obfuscation around women on senior boards, with women on boards reaching just over 20% in Northern European countries and less than 5% in the Middle East, Southern Europe, and Russia. But there is a lack of clarity on whether women hold executive or non-executive roles. Recent research on FTSE 100 companies reveals a twist in the good news tale of increased female representation on company boards. The rise in numbers is concentrated in non-executive directors – from 806 in 2013 to 826 in 2014, with a decline in the number of executive directors from 307 in 2013 to 291 in 2014. This is significant because non-executive directors stand back from the day-to-day running of the company. They do not have the same significant presence as executive directors, who can act as mentors and agents of change. Management is now a profession where women are taking a significant share of positions and diversity is declared as good for business. The numbers of women in middle management and not in the top echelons is a result of women being boxed into certain roles and not necessarily for the right reasons. In management, women are classified as having the right people skills, able to tap into female consumer power and adept at extracting employee commitment. The result is that women managers tend to have roles that are classified as female specialisms – offering less pay, prestige and career promotion opportunities. The ILO demonstrate how jobs such as human resource management, PR and communication are almost entirely female dominated. In functional areas such as finance, research, operations, and general management, women managers remain a much smaller minority. This is particularly important in the context of the generalist character of senior management, where women appear to be excluded through lack of necessary experience. This separation into defined roles is the modern-day continuation of historical biases regarding their disposition and capacity to lead. It also reflects a certain degree of self-selection, as women choose to enter roles where they feel they fit. This, however, is inevitably influenced by the environment they grow up in – a lifetime’s experience of expectations to behave in a certain way – as well as the reality of acting as society’s carers. It’s clear that the position of women in the global labor market is not a simple reflection of their actual skills and career choices. It is a product of institutionalized exclusion which, although allowing the mass entry of women to certain occupations, is responsible for keeping them unequally positioned economically. If, we do not face up to this, progress toward equality for women in the workplace will continue to be glacial. Unless action is taken, the ILO forecasts that it could be up to 200 years before women achieve parity with men at management level globally. Nor can developed countries claim the moral high ground, as we look forward to another 80 years before we might enjoy equal opportunities.